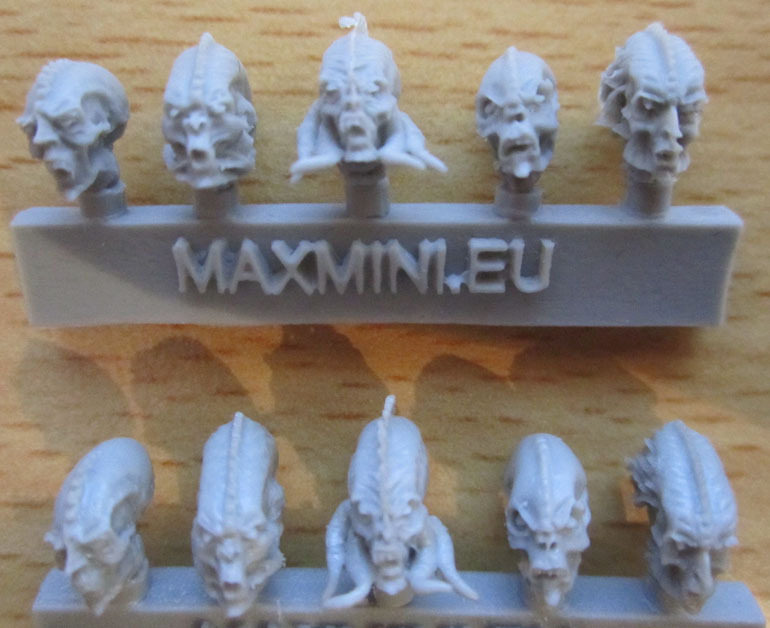 Maxmini | Azazel's Bitz Box. I’ve finally managed to get time to spray, base and photograph the second half of my Minotaurs Devastator Squad. 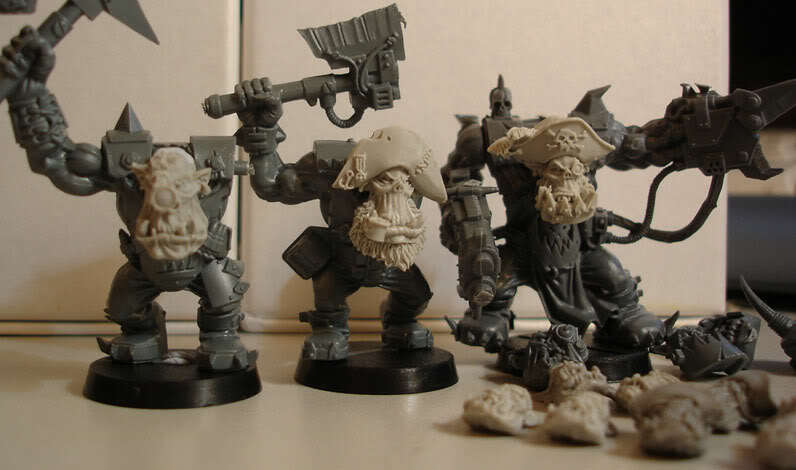 Like most of my Minotaurs units, there’s a bit of kitbashing going on to keep the models interesting. 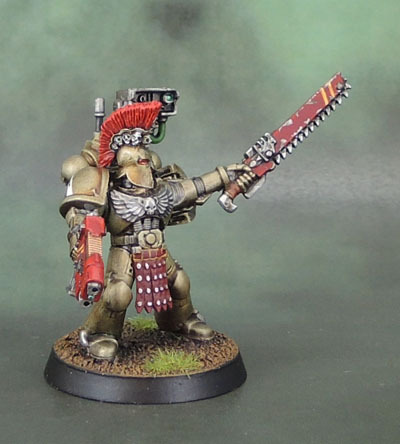 I painted the red base and yellow lines on his chainsword, but went around the scratches that Damo had put on the original, to incorporate them into the finished model. 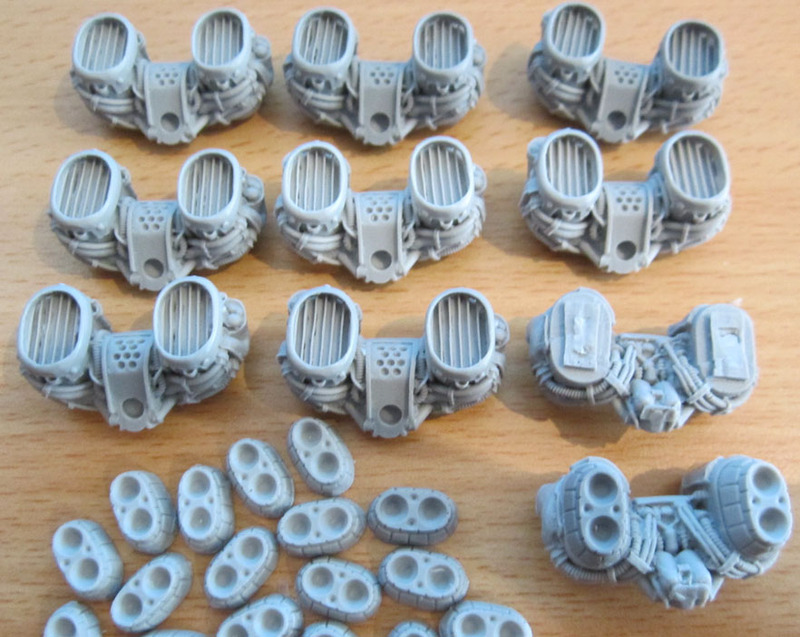 I also added pteruges from Anvil Industry over his crotch – Centurion Leather Straps. 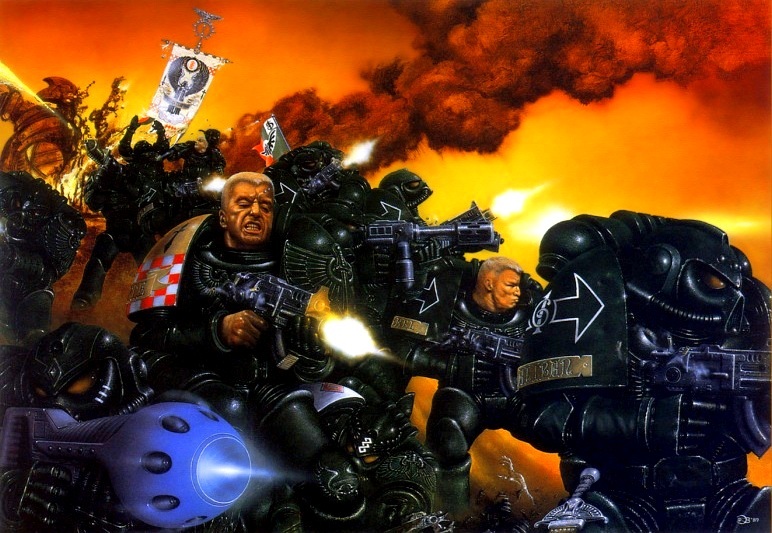 The bolter that Damo had originally armed him with was also removed and replaced with a Combi-plasma for practical, gaming purposes. 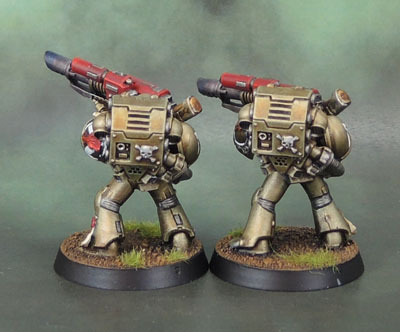 The backpack scanner’s metals were left pretty much untouched from Damo’s original scheme, showing the contrast between the original armour in tone (the armour was more coloured than the scanner) and the scheme I use. I also swapped out the left shoulder pad for a Forgeworld one, in keeping with the rest of the squad. 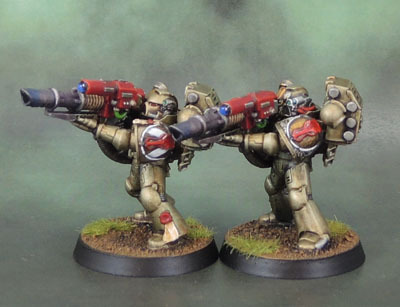 When outfitting the Devastators, I knew that I wanted to use the two Lascannon models that Damo gave me, which left me with working out what weapons I wanted to use to compliment them. 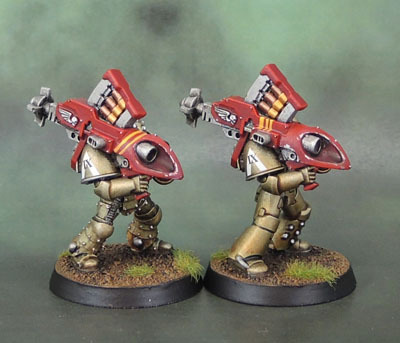 One of his Heavy Bolters has been in use for some time now, and the other is awaiting a new squad to join. 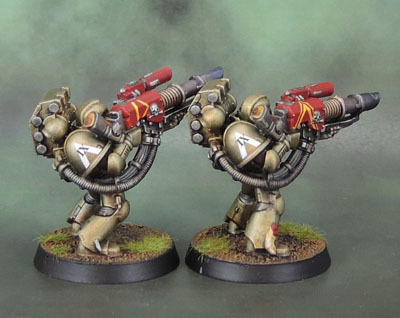 I went with the traditional jack of all trades – missile launchers. I used Calth parts for the weapons. 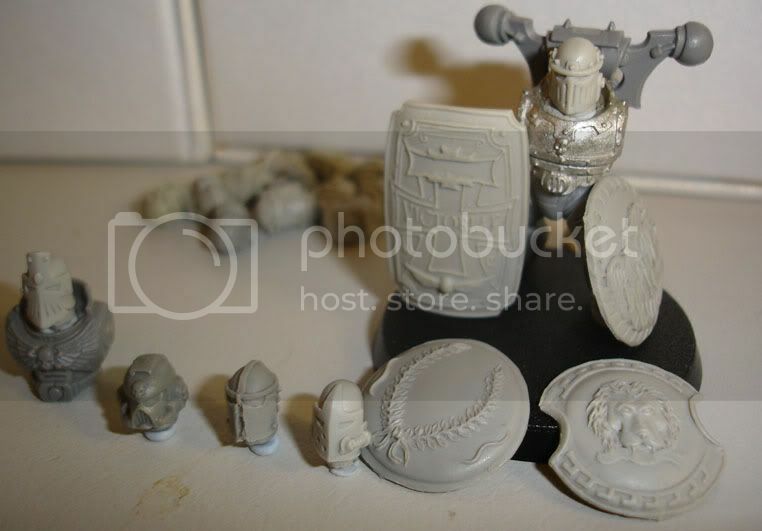 The right-hand model is mostly Calth MKIV parts, along with FW MKIV Minotaur shoulder, along with a Anvil Vanguard Torso, which I bought a bunch of years ago for my Minotaurs as the gorget makes them strongly resemble MKVIII armour, which the Minotaurs were said to have a fair supply of. I didn’t bother on this guy because of his arm being in the way, but the bare chest also makes them easy to add transfers or other details to. 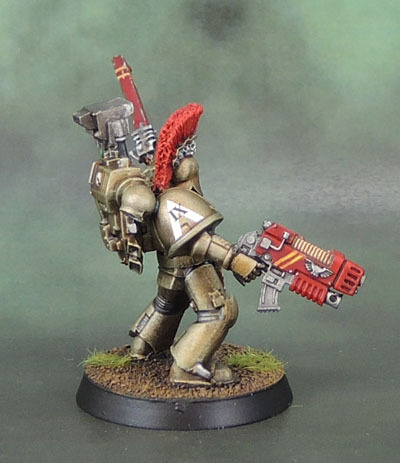 The other bloke wears a more cobbled-together suit using a bunch of FW parts with the same Calth Missile Launcher. MKV head and Torso, MKII legs and shoulder, A bit of wear, staining and scoring on the launch area of their weapons, and they’re done. Incidently, the official FW Minotaurs transfer sheet (sadly OOP now) has their Devastator badge as the “explosion” variant. Clearly though, the Lambda is the most appropriate to use for Space Spartans. 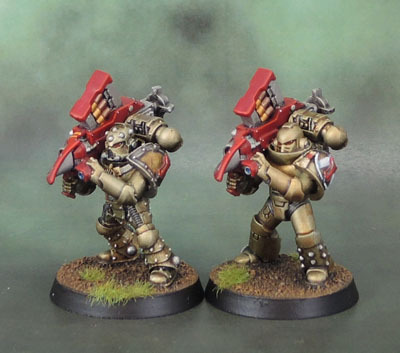 The two Lascannon operators both wear pretty standard MKVII armour. I retained much of the work on the weapons, adding the red weapon casings and putting in the brass of the barrel coils. I might have repainted the barrel tip casings, but I wanted to keep the great heat-discoloured metal that Damo had done, so I left them as-is. Once again, FW Minotaurs shoulder pads were added and the armour was “brassed up” a bit from the original to fit in with the rest of my force. And finally, we have the completed squad, with both sections present. 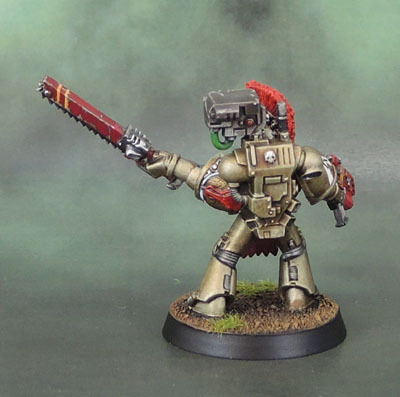 Next for the Minotaurs are some HQ units, and then some Terminators. Much the same as the last post, this is mainly so people can see what this stuff looks like in some decently-sized pictures and get some feedback. 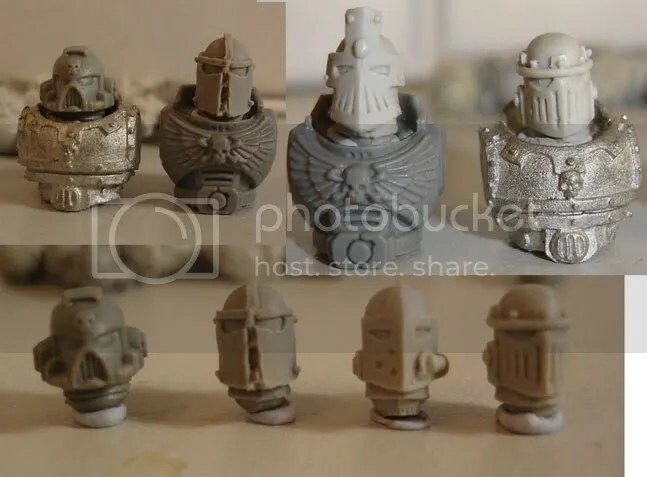 Like the Orc heads from my previous posting, these Steam Knight pieces are great. I haven’t taken close-ups of every one of them. You can see the designs on their website anyway. 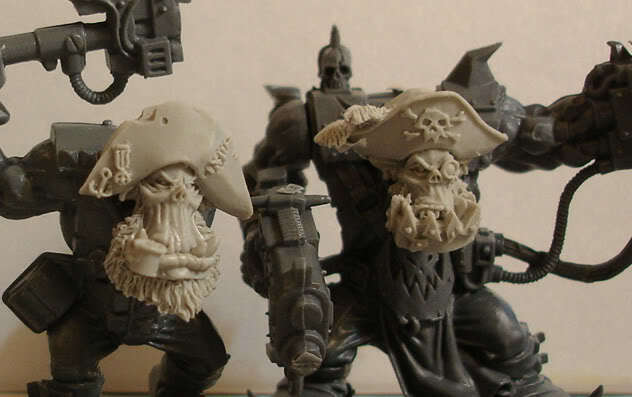 This is much more to show how they compare size-wise to GW’s marine heads and also to show how they fit on marine torsos. They’re a little taller and thinner than the standard, as they don’t have the large “ear/headset” sections of your standard marine helmets and are a little taller, but I think they fit in very well anyway. 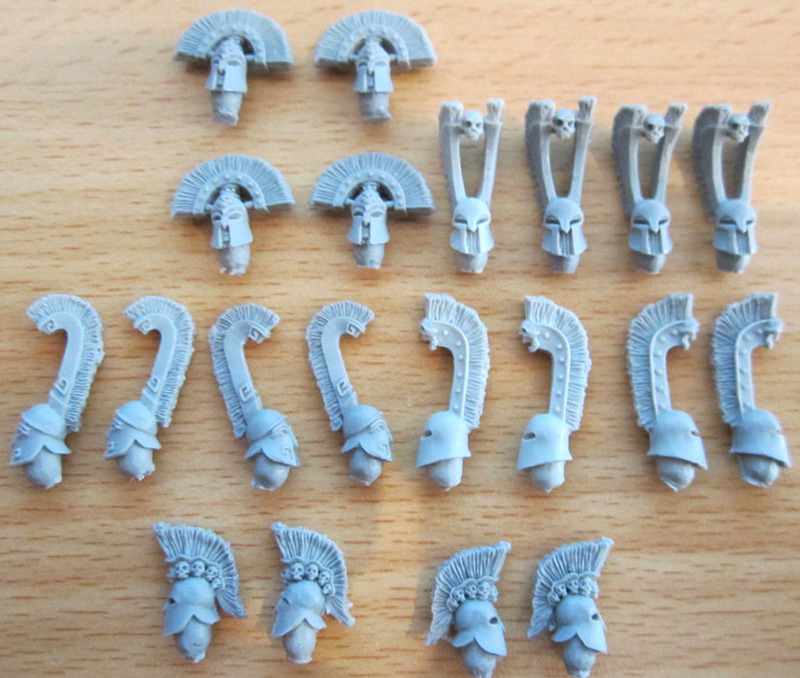 I plan to use some of them for Templars, possibly some for Grey Knights and some of them for Iron Warriors. I’ll probably order another set or two, just to make sure I’ve got enough for my IWs. 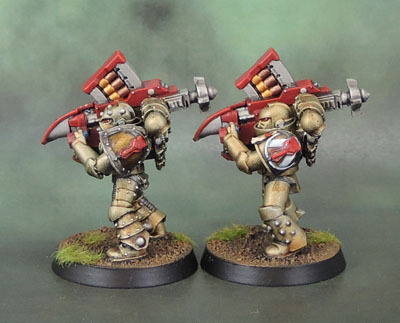 The Gothic Backpacks set gets you six (two of each) and while they’re not especially cheap, they’ll make great characterful backpacks for Templar marine armies. I’ve provided a comparison pic with Helbrecht’s backpack, a normal plastic marine backpack and also a chaos marine backpack. I probably won’t order another set of these, since I want them to stand out on character models (Chaplain, Techmarine(? 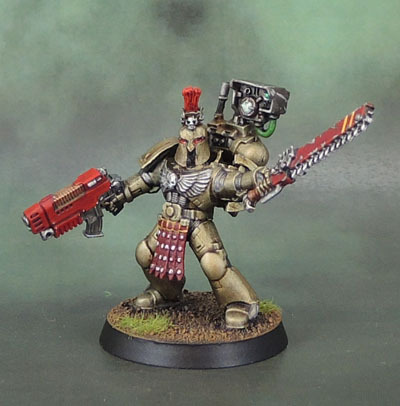 ), Emperor’s Champion, etc), though I might end up getting some more down the line for the unofficial squad leaders amongst the Neophytes and Sword Brethren. 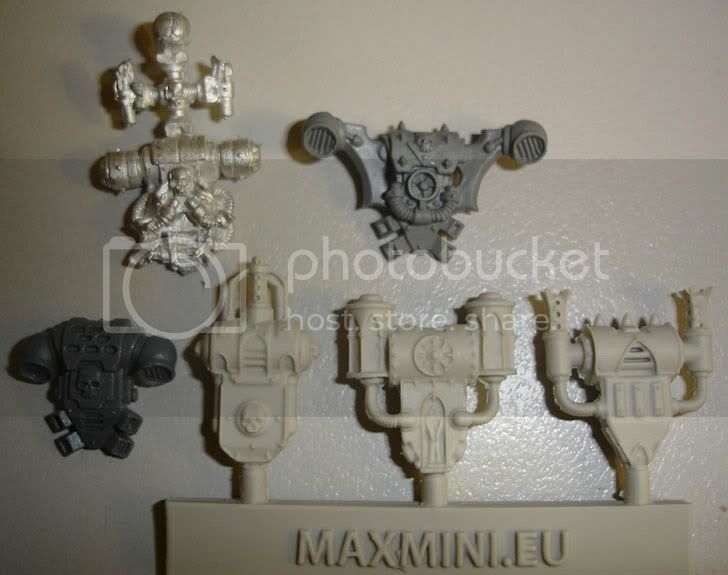 I also picked up two different sets of Maxmini shields. I got a 10-pack of the Mechanical Shields, which is shown here by the larger one with the cross – as you can see, quite a decent size. 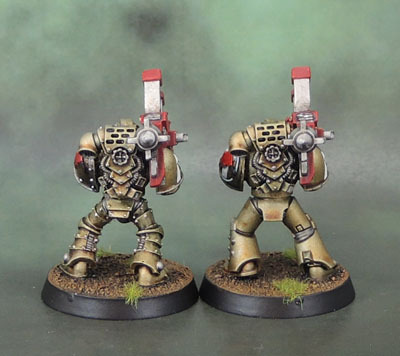 They’re also offered as a 5-pack with 5 hammers but I passed on that since I think they offer better hammers elsewhere and I’d rather have twice the number of awesome shields than half as many with some merely “alright” hammers. 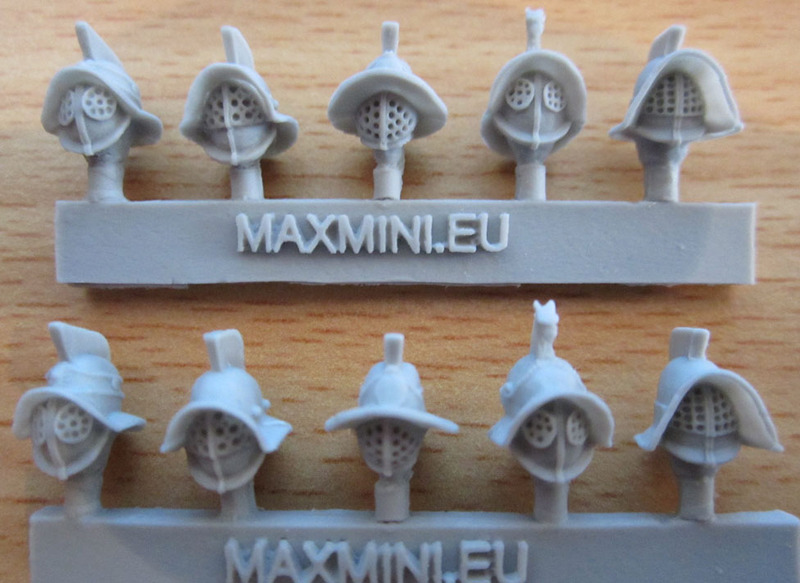 (I wonder why you can’t get some Mk1 hammers mixed in with Mk2 ones in an order?). The smaller round shields (Black Lotus Tribal Shields) also look good, and came in a 10-pack. 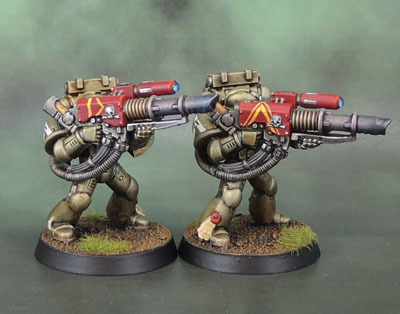 Not sure where the name comes from, but with Eagle, Lion and Wreath designs on them, they have a nice strong “classical” look that will fit in with many space marine armies. 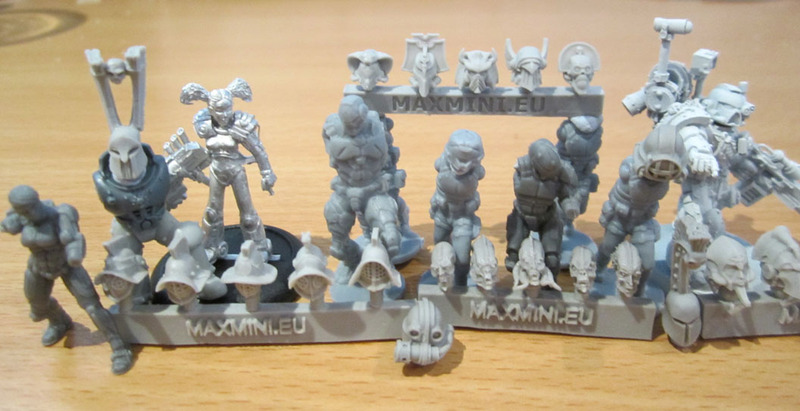 I’m really happy with all of the Maxminis stuff I picked up, and I’ll most likely make another order from them within the next couple of weeks. That’s it for now! Next – Scibor. This week I was lucky enough to take delivery of several sets of resin conversion parts from a trio of Polish sculpting studios. Since I know I’m always keen to see “in hand” and decent quality pictures of these things (as opposed to the website pics which can be small or not so great or even “too perfect” 3D renders – and they usually can’t show you comparison pics with other manufacturers’ models, so I’ll do some of that as well. 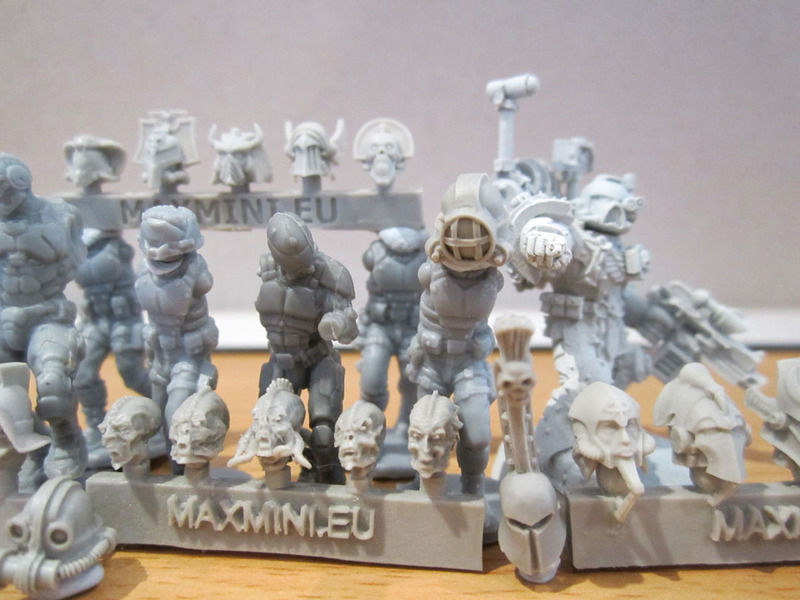 First up is some stuff from Maxmini. 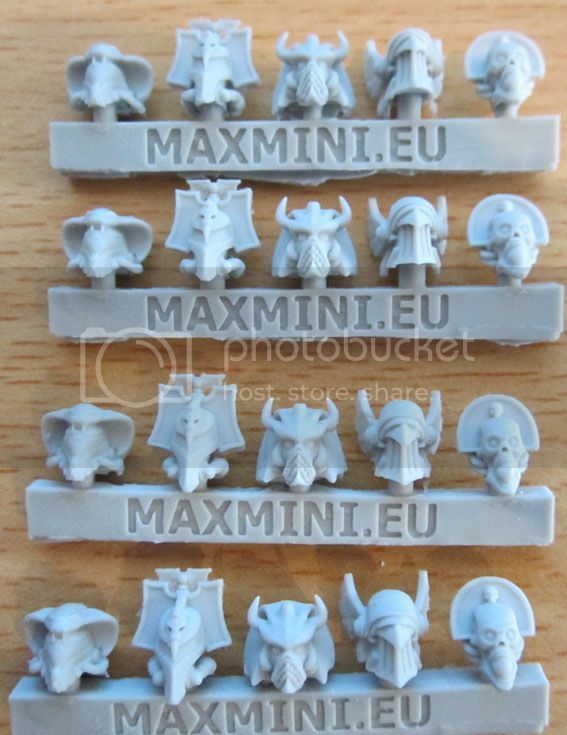 I have the Maxminis Pirate Orc heads. Just right for any group (crew?) 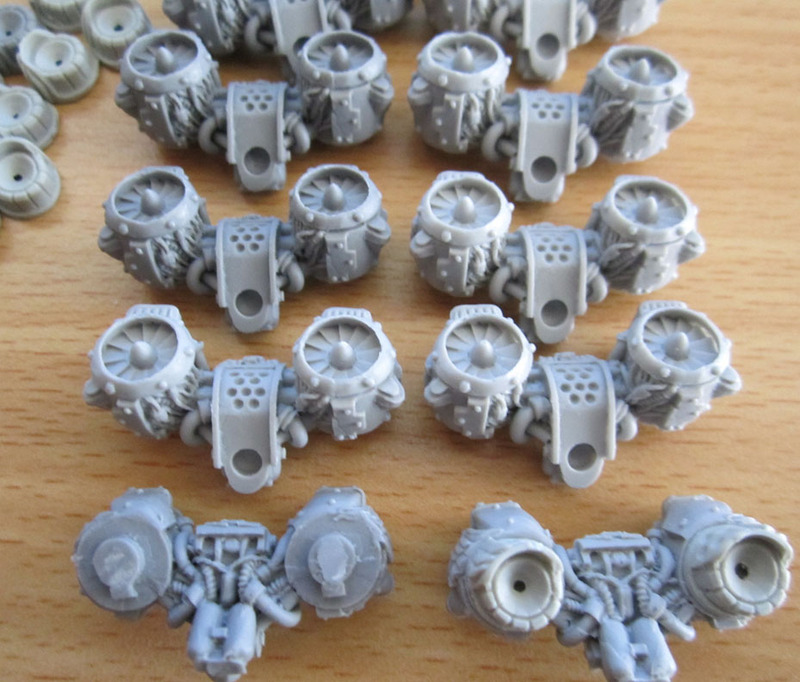 of freebooting Orcs, Orks or even Orx that one may want to put together. 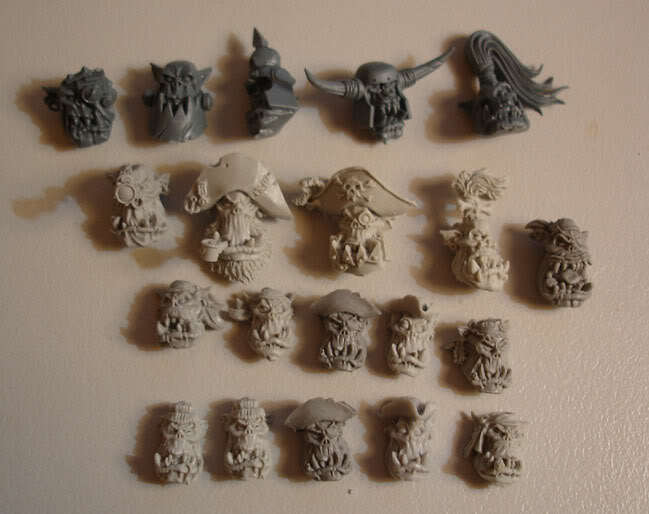 I picked up both sets – the larger Nob-sized Pirate Orc Heads as well as the smaller Pirate Orc Boys Heads. Comparison shot with some Black Reach Orc Nob heads, and also a couple of pics of a couple of the Nob heads blu-tac’ed onto some Black Reach Ork bodies. Brilliant sculpting. 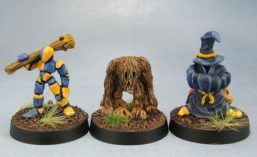 Easily on a par with or better than GW (better than their plastics, equal at least to their metals and I haven’t checked out finecast yet). 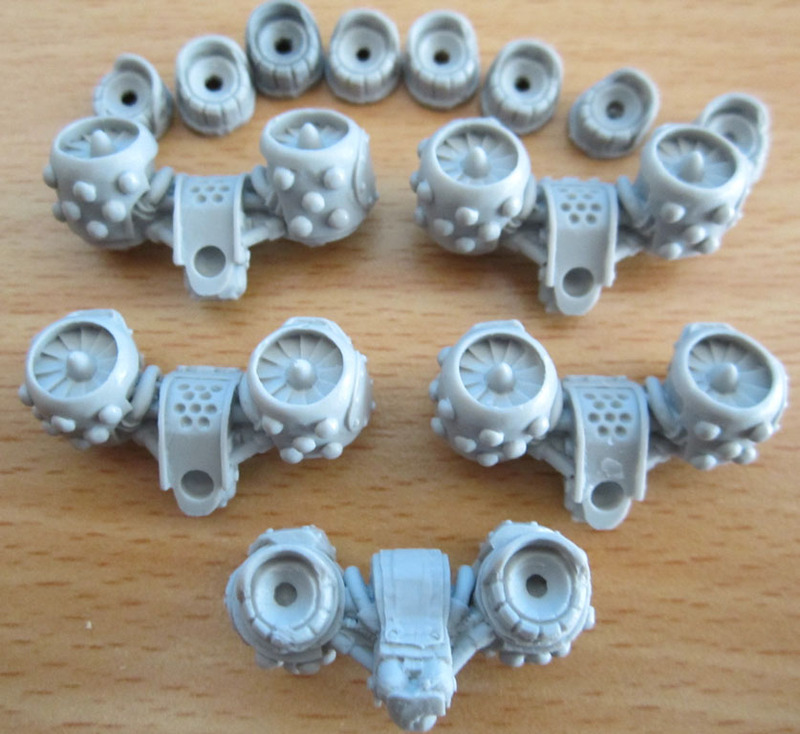 The resin is good quality – not the kind that makes your hands itch after touching it, and as can clearly be seen by these pictures, there are no miscast parts, no bits of the mould stuck in the detail, and not even any bubbles in the resin. Cleanup would take about 40 seconds-1minute per head – just trimming any tiny pits of chin flash (not all of them have any) and flattening the base of the neck. Top quality! 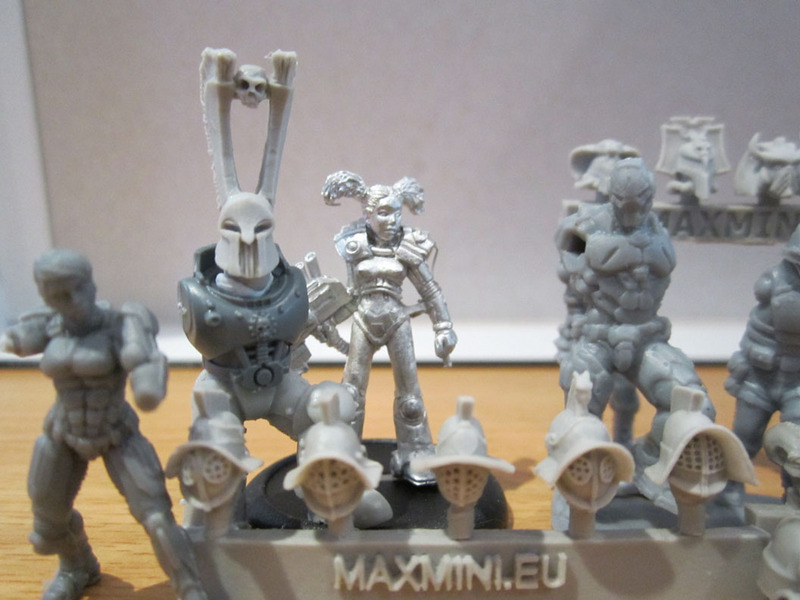 I’ve also got some of their Steam Knight stuff I’ll put up shortly – probably tomorrow if I get time. That’s also extremely well done. 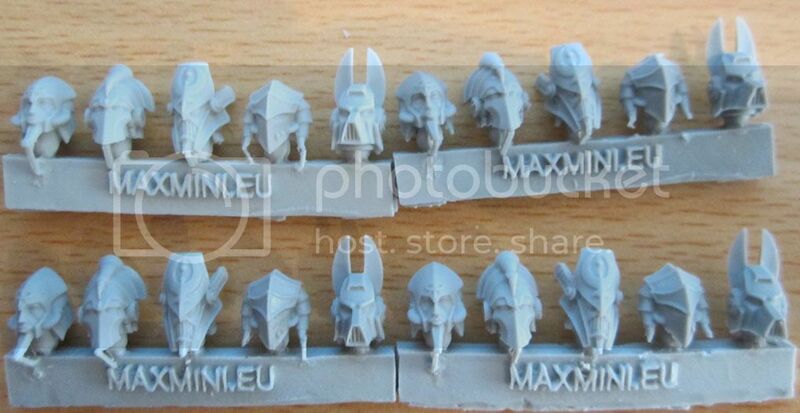 I’ll definitely buy more of these guys’ Orc resin pieces in the future.